Being open and honest about your materials, your sourcing and your practice. Knowing where your materials come from and who mined them – “traceability”. Choosing materials that help support artisan miners e.g. gold or gemstones. Completing due diligence on your suppliers – asking the difficult questions. Choosing materials that have a lower environmental impact. Choosing not to use materials (precious metals and gemstones) that come from countries where their sale is suspected of funding wars and civil unrest. Using recycled materials – whether that’s metal, gemstones, or in your packaging. Not using animal products in your jewellery. Being willing to change how you do things. Is this what you thought I’d say? Is there something I’ve missed? Comments welcome as always. I thought we’d have a look at precious metals today and I’d really appreciate your thoughts on the options. Option 1: 100% recycled metal – post consumer waste/scrap jewellery/industrial waste etc. Not traceable so no way to tell where it originated from, but there’s no new mining, so better environmentally but no positive social implications. 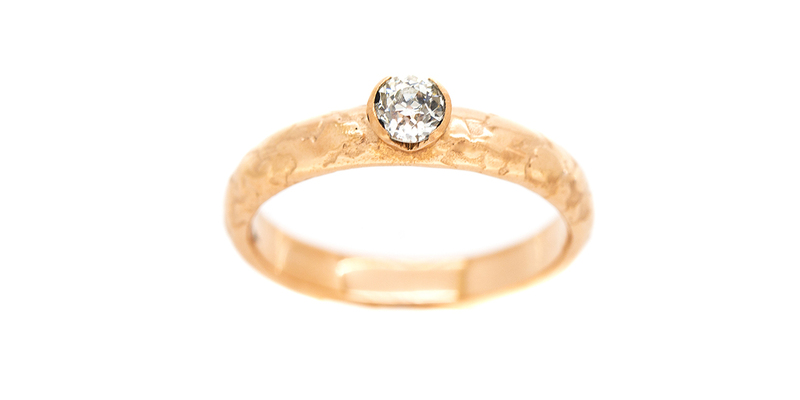 Option 2: Fairmined/Fairtrade metal – artisanal mining (just a few people in a smaller mine). 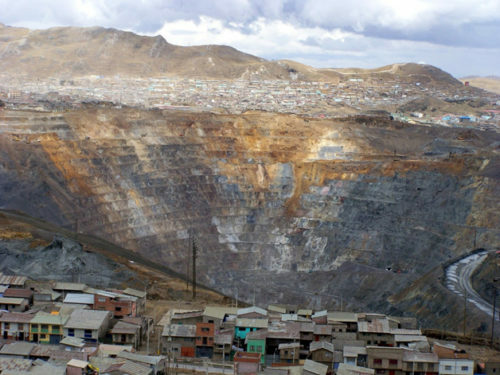 Under the Fairmined scheme, miners are helped to put health, safety and environmental standards in place, children don’t work in the mines, there are positive social implications such as schools, roads, healthcare. Miners earn a fair wage, the mining doesn’t fund wars but new mining still has an environmental impact. The metal is traceable to its source. Option 3: Single mine of origin metal – will come from a larger mining company, so a bigger mine and thus more environmental impact, but will have good health and safety standards, environmental management, no child labour and doesn’t fund wars, but it is new mining. May or may not have positive social implications. Traceable. Option 4: Standard metal – will come from a variety of sources, none of which will be traceable e.g post consumer recycled metal, scrap, including some new gold from many different mines. Large mines do bring significant wealth for the countries in which they exist, however local communities are unlikely to benefit, they may no longer be able to mine the area artisanally and are unlikely to have the skills needed to work in the modern mechanised mines. Some metal will have come from artisan miners, who may be working under unsafe conditions, using child labour, mining using practices that affect health e.g. unsafe mercury use . So peeps, what do you think, what would be your choice? If you’ve stumbled across my blog, please sign up below and you’ll get an email each time I post. As lots of us these days buy less “stuff”, when we do buy, I think we’re more likely to spend time looking for exactly what we want. Do you agree? A lot of my customers are the same. They’ve got an idea in their mind for what they’d like, they’ve maybe looked on the High Street, been online, disappeared down the rabbit hole that is Pinterest and still haven’t found the thing that is just, quite, right. That’s often when they’ll get in touch with me, to see if I can make something that’s entirely them. That fits with their ethos, that takes into account the sentimental stuff, offers them options, allows them to personalise their purchase and to get involved. For some clients, it’s the opportunity to reuse sentimental pieces that appeals most (melting down the gold to make it into something else and reusing stones). For others it’s having a piece designed specifically for them, that’s exactly as they want it to be. Sometimes it’s because they know whatever I make will fit their ethos, that they can be safe in the knowledge it’s been ethically sourced. Sometimes it’s because they know they can be involved in the design and choices and want to be involved in that process. Or sometimes it’s simply because a friend has recommended me, they know I’ll do a good job, that I’ll be easy to talk to and will really listen to what they want. This latest commission came to me because they needed to find a jeweller who could work with the gold that they’d found prospecting up at Wanlockhead. 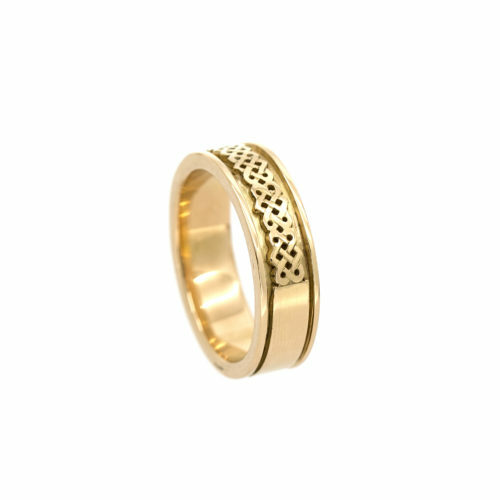 The design was a traditional Celtic one, of interlinking loveknots making up a 6mm wide 18ct gold engagement/wedding band. It was hand made in 4 parts (inner band, top and bottom rails and central pierced pattern) before being soldered together. A beauty, but an intricate and very time consuming beauty! For a lot of folks, not surprisingly, commissioning someone to make a piece of jewellery (or any other artwork) is out of their comfort zone. They wonder if they visit someones studio will they feel obliged? What if it doesn’t turn out like they imagined? What if the person takes their money and is never seen again? I get that, I’d feel the same, which is why it’s important to have a chat, see if you connect, have a look at other work and just see if you think you can work together. If you’d like to find out more about having your own piece of bespoke jewellery created, please get in touch. Questions or comments, feel free to ask below. What does ethical mean to you? I actually hadn’t made up my mind what todays post would be about, but I was prompted by an instagram post on a site for eco friendly and ethical brides to be. Ethics is a really good topic though and what ‘ethical’ means to each of us may well be different. If someone describes a product or business to me as ethical, I’d expect them to be environmentally friendly, to be honest, transparent in the information they give out, to do what they promise to do, to not use animal products and not test on animals (cruelty free), to be sustainable, use recycled materials, to source their products or materials from places that treat their workforce properly (no sweatshops/child labour/equal rights/fair pay/safe and healthy working conditions etc). There’s lots of other things you could add into this, e.g. organic, fairtrade, natural…. The post that made me think about this, was one promoting silk. Silk has long been coveted for it’s beautiful feel and the way it looks and drapes, but to me silk isn’t ethical. Silk is made by silkworms, (little caterpillars) that make a cocoon at the pupal stage and it’s the cocoon that’s unwoven to make silk thread. The problem is that for the silk moth to emerge it would have to eat it’s way out of the cocoon – like butterflies do, but that would damage the silk and so they are gassed or boiled alive before they emerge. Whilst insects may not be like us, they do have a pain response, so it’s not the same as harvesting a lettuce say. Child labour is often seen in the silk factories (small hands are nimble), there are also issues around dyeing and the discharge of toxic effluent by the textile industry. So I don’t think silk is ethical, natural, yes (in the sense that the material is) but not ethical. 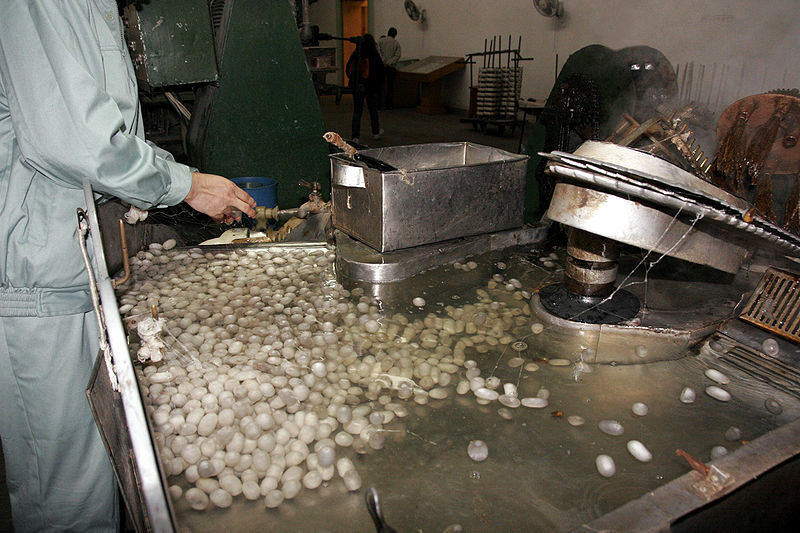 You can read more about silk production and its alternatives here if you’re interested. Ethical, like other words such as ‘green’, ‘eco friendly’, ‘sustainable’ and ‘natural’ often seem to be bandied about and used interchangeably. I suspect it’s quite possibly because there is now a huge market for products sold as such. Does anyone else wish life would just slow down a bit? February has been non stop, where has this month gone? Admin, emails, quotes, appointments, applications, making, mentoring, researching, Spring Fling prep, dentists, eye tests, catching up with friends & family, car related stuff, looking after furry folk, chopping logs, trying to fit time in during the day for the gym or a run. Do you hanker for a slower life? Less email, less social media? More time in nature, less time in the office? I do. Whilst I haven’t managed much this last month, I have made the most of the good weather and taken a cuppa into the garden for 10 minutes peace and quiet, these last few mornings. If you can manage it, I highly recommend it. What are your top ideas for a bit of breathing space? Comments below please. Hello, more chunterings from the bench (or the sofa if truth be told!) I thought you might be interested in my ramblings about diamonds…..
What do you know about diamonds? They’re made of carbon, formed under under huge pressure and heat in the earths crust. They’re hard, often used as cutting or polishing tools in industry, they occur naturally as crystals, they’re all probably at least a billion years old. Ethical, traceable diamonds are in some respects, dificult to find. Most diamonds these days come from Africa, Russia, Australia and Canada. Obviously diamonds are a lucrative business, one that is interesting to warlords, dodgy government officials, or anyone who’d happily exploit another person for for ill gotten gain – whether that’s kids down mines, paying miners peanuts, dangerous working environments or quite literally stealing diamonds at gunpoint. A far cry from the glittering aray of jewels in the jewellery store. Recycled diamonds – saved from old jewellery, repolished and resold. Pro’s – no mining, recycling Con’s – do you mind your diamond having been preloved? Not traceable – may not originally have come from an ethical source. Laboratory created diamonds: made from Carbon exactly the same as natural diamonds, heat and pressure recreated in the lab. Pro’s – no mining, traceable, ethical. Con’s – not mined so not natural. Less environmental impact than natural diamonds but does have some impacts. More on another post. Ok, that’s enough from me, hope you enjoyed this tour around diamonds. If you’re looking for a piece of diamond jewellery and you’d like a chat about options please get in touch. Let me know what you think in the comments (if only so I know you’re reading). Is there anybody out thereeeeeee? In my last post, I said I’d revisit the whole thing about nothing ever being truly cheap and how someone has to pay. Whether that’s buying something that falls apart 6 months later and has to be replaced, or cheap fashion that costs the environment, or children working in factories for a pittance so we can buy things cheaper in the West. Consumerism and advertising have created an obsession in people to have the next big thing, the new car, the bigger house, the latest gadget, or this seasons fashion must have. Things aren’t built to last, because companies don’t want them to last, they want you to throw them away and buy the latest model. They manufacture abroad where it’s cheaper and where profit margins are higher. Goods are mass produced and made of cheap materials like plastic. Who pays? The environment, wildlife, the people working in the factories under poor conditions and the consumer, who gets a poor quality product, albeit a cheap one. Like everything, we have a choice and we can vote with our £’s. I don’t buy much, but when I do, I’d rather buy things that will last. Clothing that I’ll wear and wear and wear. Things made by hand that I’ll perhaps only buy once or twice in my lifetime. We can all have things repaired (a new zip on that coat rather than a new coat), recycle or give things away to someone who can use them, we can upcycle things with a lick of paint, buy furniture at auction (great fun, give it a go), or give the charity shops a whirl. So how does this all apply to jewellery I hear you ask? I chose to work in recycled and Fairmined metal, even though it’s a bit trickier and more time consuming. Recycled metal doesn’t entail mining and therefore minimises further damage to the environment. Fairmined supports miners in some of the poorest parts of the world, to earn a living, whilst paying them a fair price for their gold and helping them to raise health, safety and environmental standards in their mines. It does cost a bit more, systems have to be put in place to monitor and audit the process. It’s not the cheapest or quickest way to do things, but for me, worth paying a bit more for. The norm for a buyer purchasing rough diamonds and gemstones, is to buy from lots of different miners to create parcels of the same quality. They’ll go through the cutting shops and be sold again, before reaching the final gemstone dealer. By the time they get to the jewellers shop, no one really knows where they came from. The only way to know if your gemstone or diamond is ethical is to know where it comes from and track it all the way from the miner to the consumer. These are known as traceable stones. It’s expensive to track single stones, to monitor conditions in the mines and the cutting shops. It costs money to improve health and safety, to pay decent wages, to safeguard the environment, to only employ adults and to give back to the community in terms of schools, roads, infrastructure or whatever else their needs might be. When you buy a piece of jewellery that’s sourced in this way, you can choose to have it made in a way that mirrors your own personal beliefs. If you’d like to support artisan miners, working hard to improve life for their community, we can use Fairmined metal. If you’d like to avoid the impact of mining, choose recycled metal and lab created or recycled stones and diamonds. If you’d like to support a mine that’s ethical and sponsors an orphanage in Tanzania, we can do that too. Beautiful jewellery, with the feel good factor. What’s most important to you? Let me know in the comments below and if you haven’t already signed up, please subscribe below. Getting yourself known, getting your artwork “out there”. Whether it’s social media, advertising, selling work through galleries, open studios, via a website, a pop up shop or an artists co-operative……there are lots of ways to try and get your work seen and it’s something that’s essential for any small business. After all, if no one knows you exist, how will they ever know to buy from you. You’d have thought perhaps that social media had made it easier for artists and makers, what with facebook and instagram, pinterest, blogs and social media inflencers. After all, being able to sell your work all over the world is a great opportunity, but in some ways, I think it’s made it harder. Social media is great for raising awareness of injustice, the state of the planet, for keeping in touch with family and friends abroad. For small businesses though, there are just more tasks to keep up with and less ways to stand out in an increasingly noisy, over saturated global market. Go back 50 or 60 years, people didn’t travel as far, there was no internet, they bought what they needed in the local town and the towns thrived. There were jobs for local people, things were made locally, money was spent locally and stayed locally, products were made to last. Businesses to some extent had a captive audience. Nowadays, people buy online, often from the other side of the world (and often because it’s cheaper). Have you heard these said recently? “Nothing is ever cheap, someone, somewhere will always pay” or “Buy cheap, buy twice”. What are your thoughts on these? Over the years, I’ve attended lots of fairs and events, from small craft markets, through to huge trade fairs and open studios. I’m mentoring at the moment, on behalf of Upland, the folks who run Spring Fling Open Studios (www.spring-fling.co.uk). One of the things we were discussing was ways to promote, tell and show people, what you do. Whether that’s advertising in print or on social media, selling via galleries, your website or another web platform such as etsy, or taking a stand at one of the larger art and craft fairs. Many of the trade and public selling shows are open for applications at the moment. You fill in a (usually) pretty long form, (sometimes) pay a submission fee and send your application and images off into the ether. A committee will then look at your information and the images you’ve supplied and will decide if they’d like you to show at their event. Then you have to pay for it (always :-)). Stand fees for events can run into the thousands and that’s before you’ve paid for the extras…. a plug socket (no I’m not joking, £50) or to have an image in the brochure, or for a display case. Then there’s the time you spend before the show making things, planning the display, the time you’re at the show (when you aren’t making things….time is money and all that) your petrol, accommodation etc. In short, all of these things can cost an arm and a leg, but it’s part and parcel of being a business. Shows and events like Spring Fling Open Studios, which I’m taking part in again this year (25-27 May – put it in your diaries lovely people) do give folks the opportunity to come along, meet you and have a chat in a low key, no obligation kind of way. I know not all artists and makers do this, but you can give me a call and pop to see me in the studio for a chat all year round. That said I know not everyone feels comfortable doing this so open studios and events are perfect for folks to do a little surreptitious snooping and to quietly suss us out. I’ve seen various articles in the press recently, where some enormous jewellery business has told the world that they are doing something special…. usually something some smaller company has been doing for ages (but didn’t have the PR firm, advertising budget, time or contacts to publicise it). Take Pandora, who I think pretty much everyone has heard of. They came out of nowhere, spent a fortune on ads on TV and in glossy mags and are now a household name. These big companies can afford to pay PR firms to put their jewellery, clothing, cars etc with celebrities to raise their brands status. They can afford to pay social media influencers to blog about their products and promote them to their followers. The little guy doesn’t stand a chance. I could say then, that luckily most artists and craft makers are in this for more than just the money. And they are, often it’s about communicating something, or the pleasure of making by hand or by making a living doing something they love, or they might be trying to make a positive change in the world. Something the larger companies and their shareholders aren’t quite so concerned about. But, even if it’s not just about money, artists and makers need to make a living too. They should be paying themselves properly and pricing their work fairly. The starving artist label is no good to anyone. I don’t believe artists and makers are selling out by making a living from their work. Artists and makers are running small businesses just like any other, paying mortgages and bills, putting fuel in the car and food on the table. Contributing to health, wellbeing and the economy. Tell everyone about them, ask them for their cards and hand them out. Comment on and share their posts on social media. Give them feedback. If you’ve bought something from them/seen their work somewhere, leave them a review/send them an email or card (you’ll make their day trust me). Send them a photo/post a photo online of you wearing whatever lovely thing you bought/ or of that picture or piece of furniture in your house. Go and see them at events/open studios/sign up to their newsletter or blog. Huge thanks to all my lovely customers who regularly do the above. Hope you’ve enjoyed today’s blog post, I’ll revisit with “Someone always pays” next time.